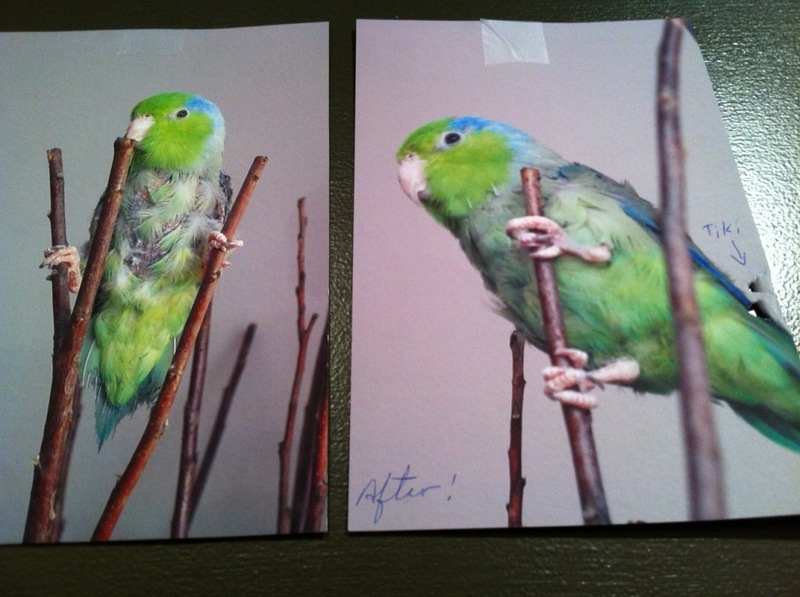 Teki the Love Bird before and after the Flower Fairy salve on it's little skin and feathers! I was 1st introduced to your Arnica Pain Ease Salve by my Chiropractor (Dr. Garth Edgar). It was very soothing and I had noticeable pain relief. I was so impressed and told my father about the pain benefit. He has used the Salve every morning and every night for the past three months ~ the relief from the pain of his arthritis is so great that he has postponed his knee replacement surgery! I want to express to you my deepest gratitude for giving my son, who was diagnosed with ADHD, an alternative to taking prescription stimulants. I was horrified when his school called me in for a meeting and suggested I "medicate" as he was having a hard time focusing and staying still and quiet in class. I believe that everything happens for a reason, and meeting you that chance day in Thrifty Foods was a gift from God I am sure. I thought of you and our conversation from months earlier as I was meeting with a pediatrician to entertain the idea of stimulants. I left the Dr.'s office never to return. I am certain I am not the only parent who agonizes over this decision, to medicate or go a more natural route. It has been about 5 months now with my son taking the vitamins, supplements and implementing the diet changes, getting gluten and dairy out of our home, and I stand behind what you do professionally. I am amazed at the changes I see, life isn't perfect but it is manageable, and for a kid who struggles with ADHD that's pretty good! Words can not express the gratitude I have for you, Jacqueline! Many Thanks - Pamela M.
Well I finally did it. After 25 years as a chiropractor and reaching my 66 birthday, I decided to check my health. I asked Jackie Clow to do the 30 point organ check and recommend remedies. She makes her own remedies and we at the office have been relying on them for years. At 66 I was most concerned with bone, heart and prostate issues. I was pleasantly relieved to find my heart and prostate fine. I did need bone mineralization, and a boost to my liver, spleen, adrenals and endocrine system. I was also pleased to find her remedies worked best for me. The cost was much more reasonable and the quality tested best. I thoroughly recommend this very professional lady to anyone who wants a checkup. As a chiropractor who needed to graduate with 4 years of nutrition, I humbly say she knows more about biochemical pathways to health than I do. She could easily teach a course. Wanting a functional life to 100 years is my goal and I know am much encouraged. Sincerely Dr. Garth Edgar D.C. I have been under the care Jaqueline Clow for almost two years and have had huge health improvements! One of them being a major hormone re-balancing through vitanins and minerals I have started receiving my period on a regular basis and I no longer suffer with chronic constipation. I have no arthritic pain because of the diet changes she encouraged me to make. I am healthier, happier and stronger than I have ever been in my life before. Jaqueline has been gifted with the divine talent to help heal people. Because of this her brain is able to absorb some of the most complex and sophisticated information on how the body works on a cellular level. Thank you for helping me heal through a lifetime of chronic pain and discomfort. I appreciate you. I saw Jacqueline to receive counseling on IBS. She made recommendations using the Avatar in combination with her extensive knowledge and intuition. It was really interesting to see my body's reaction on the computer screen. Her recommendations and herbal remedies have helped me immensely. Try it out! Flower Fairy Pain Balm is what I turn to when I have muscle aches, broken bones or indeed any kind of pain! I find if I put some on the affected area, wait an hour, and put some more on, my pain goes away, and stays away even when I broke my toe! The throbbing was reduced to the odd wince when I stepped wrong. I love the stuff, and have sampled it on many people who have found it so effective they have in turn bought it! Something I keep meaning to mention: your Flower Fairy Cold Sore Salve also works wonders to heal any hint of an outbreak of genital herpes; so that's great!!!! Victoria, who I have been dealing with for decades. I used the Magic Balm daily, after 2 weeks all the horrible red marks were gone! I am so happy and amazed my complexion is normal again. I am so happy this product is out there! Thank you Jacqueline for your wonderful “Magic Balm” - a very competently made effective alternative product. I Love love love your Haemorrhoid Healing cream. I take it on all my travels around the world & in my bathroom cupboard. No matter what street meat vendor I eat at in the world or the after effects I bring home, I know I will have Flower Fairy relief! It works way better & quicker than the commercial brands. Flower Fairy Haemorrhoid cream work so quickly, right after application it soothes. Its concentrated so it goes a long way and is safe and effective inside and out. By the next day my haemorrhoids have just about disappeared! The Pain Ease Balm is truly magic! As a market vendor we use it for bumps and pains from lifting & standing & stirring our product. Work immediately! Even after our daughter had a large painful arm after a vaccination. We used the Pain Ease Balm around it and immediately she had relief! Flower Fairy Herbal Healer Calendula Salve , it truly is a God-send that I found you and your salve and hope any other women with Dysesthetic Vulvodynia would discover it. Relief from my pain started right after the first application and within 2 days I was so much more comfortable. I have been using your salve every day since and I just HAD to email you to thank you so much for making this Wonderful stuff! I will tell you that I suffer from Dysesthetic Vulvodynia. If you have heard of this or not, it is a VERY painful condition that is very difficult to treat. I read the description on your site for the Calendula salve uses, and I would like to highly recommend that you add this condition to the list so that other women will be able to find your salve easier. Again thank you so much, my life is so much better because of YOU! I began seeing Jacqueline this past summer and I am very happy and amazed at how well my health has been since then. I have had asthma for the entirety of my life, and in the past year it had begun to get quite bad. I decided to take the holistic approach to deal with my symptoms. Doing the organ test with Jacqueline gave me great insight into how bad my lungs really were, and how I really needed to do something to improve them. The tincture I recieved from her to treat them worked within days, and I could finally start to breathe clearly again. I also decided to do the allergy test with Jacqueline, as I had been having some skin and digestive issues. After that test, I proceeded to cut out dairy and gluten from my diet, feeling better within just one short week. My skin cleared up, my digestion improved greatly, and I even lost weight! The added bonus of increased energy and alertness was just the cherry on top. I am a full time student with a minimum wage job, and sometimes my money situation can be very stressful. I am very thankful to Jacqueline for being so understanding about this matter, as she has allowed me a few IOU's throughout the past few months. Her kind nature, vast knowledge, and insightful advice have helped me come a long way with my health, and I am forever appreciative to her for that! Thank you Jacqueline! I had an organ and supplement consulation with Jacqueline a few months ago and was very impressed and pleased with the service I have received from her. Jacqueline's testing provided me with insight and revealed valuable information about my health. It is quite amazng to see with your own eyes how an electronic devise is able to select the right nutritonal supplement for your body. Jacqueline is very professional and very well educated in her field. I would highly recommend her to anyone who wants to improve their health. One day I walked into Simple Remedies and the ladies asked, “what can we do for you”. To which I said, “you have so many cool things in here I knew that I can only do well by coming in here”. Within 4 seconds I saw Jacqueline’s brochure for Organ and Food Sensitivity testing and I said, “I want one of these”. I booked an appointment and since then my life changed. liquor is the worst thing you can ingest, its time to take notice. I had the organ and food sensitivity testing done and within one week of following Jacqueline’s advice I could feel a change in my body and my mind. The Barlean’s triple swirl fish oil made computer work suddenly easy. Working with high level intellects was no longer a challenge as my mind was no longer foggy. The changes to my diet gave me more energy and stamina as well as an overall sense of calmness. After about 6 weeks of taking the recommended supplements and moving away from a diet heavy in starches and more fruits and vegetables I returned for testing and it confirmed what my body and mind had been telling me. The second testing revealed that my organs had indeed increased in vitality and strength and we used the testing equipment to test for those supplements, which were best suited for my constitution. Because of the positive results from Jacqueline’s work I have recommended the same work to many friends and strangers. “Why should people spend a lifetime ingesting foods which are toxic to them?” While many of today’s GMO’d foods will not harm you immediately or kill you they slowly do damage to your internal organs and cause the build up of chemicals, which have long lasting effects on your health both mental and physical. If everyone had the same type of testing done on them before they became ill or old , imagine how much money the health care system could save?, just from alcohol alone it would be in the billions of dollars. I had been looking for awhile for a moisturizer for my face that is made from all Natural Ingredients. I decided to try the 'Flower Fairy Herbal Healer - Silky Skin' in the morning and at night. Not only is my face skin soft and moisturized, but my two dark, age spots have faded significantly. At my last facial, my aesthetician told me that I have great skin. I love the cocoa butter, coconut oil & lavender essetial oil in Silky Skin. When I felt a cold sore coming on my upper lip, I applied the 'Cold Sore Lip Balm' daily, and it helped it go away quicker than usual. Now, I apply the Balm daily to keep the cold sores away. I love that Jacqueline has made these all natural products available. I have used the Flower Fairy products for years and attribute my health and vitality to Jacqueline's products. The echinacea I found to be not only great when your immune system is low, but also works wonders on pimples! The magic balm is a great anti-aging night cream and the love spray makes me feel refreshed and rejuvenated. There's a wonderful healing energy in the products that's uncomparable. I found Magic Balm to be both soothing and healing when I developed inflamed dermatitis on my forehead, which would not respond to other natural treatments. Magic Balm also makes a great lip balm. My teenagers use the Flower Fairy Calendula ointment for skin breakouts, and as a lip balm as well. I had a stubborn patch of eczema on my hands that was not responding to conventional treatments (i.e. cortisone creams) or herbal treatments. Magic Balm worked almost immediately, soothing the intense itch and within 2 weeks my eczema had completely disappeared. I recently received Magic Balm as a gift for my baby. The accompanying brochure stated many uses including cradles cap and psoriasis and after using only a few days there was noticeable fading. My daughter has had flare ups of cradles cap and magic Balm immediately clears it up. I will buy Magic Balm and recommend it for anyone with skin problems. Three times in one year I had an Eczema type rash around my eyes. I couldnt wear any makeup and I could barely see. I tried Chinese products, organic big company name products I tried everything. My eyes were cracked peeling and raw, not a pretty sight. It started to surface again and I went to Jacqueline who set me up with her Comfrey and Calendula Combo the same day I noticed a difference. I cant explain how ecstatic I was. Recently I have been going through product after product for a skin moisturizer. I am happy with things for a while then my skin acts up all over again. I have an acne prone combo skin type, which is also very sensitive. Jacqueline set me up with her Magic Balm and I swear it is magic. I had very clogged pores on my right cheek that were gone in less than a week and my skin now has a healthy glow. I will continue to use her products and trust her advice. Thank you very much Jacqueline, I know your products and trust her advice. Suffering from a severe facial sun burn from a recent ski trip, resulting in my entire facial skin lifting and bubbling up to peal at an alarming rate; I was advised by several people to apply two topical creams from the Flower Fairy line of Herbal products, Golden Seal/Echinacea & Calendula. These ointments were literally amazing in their results!! As mentioned, the burn was quite severe, but with the appointment of each of the above, healing started immediately, the skin did peal, but there was no scarring at all and the creams soothed the burning sensation to almost nil. I have had several sun burns before, never as sever, and have never had such a quick recovery time and not had some sort of slight scarring as a result however, I believe these products helped tremendously. I highly recommend these ointments for this type of treatment, and I have since used the remaining for smaller burns, cuts etc. and find healing time to be cut in almost half compared to other cuts etc. sustained through my active sports lifestyle. I just had to write and tell you how happy I am with the Flower Fairy Magic Balm. It really is "magic"! My eczema started when I was thirty-three. Over the past eighteen years I've tried everything that claims to ease or cure eczema. Nothing has worked. So, when I bought Magic Balm I was a little skeptical and prepared to be disappointed once again. But, I was surprised and delighted to find that Magic Balm did indeed do what you said it would. The improvement was noticeable with the first application - my skin was cooled and eased - no more scratching! I've been using Magic Balm for two weeks (usually just once a day) and for the first time in years I'm not self-conscious about my skin. It looks normal and healthy again. Thank you! Thank you for making such and excellent product and for making it available at such an affordable price. I wish I had found Magic Balm years ago.